Ask some Americans to name some German coupes and I’d bet the last names they’d come up with are Ford Capri and Opel Manta. While they might be much more revered in their home country, the German Ford and Opel’s American histories were just afterthoughts and lived out their 1970s existences as most captive imports do – in relative obscurity. That's probably why they sound like such good Used Car Face Off candidates today. The Capri name has been tagged on lots of Ford Motor Company products, and even this Ford Capri earned a Mercury tag because it was sold through Lincoln-Mercury dealerships here in the '70s. 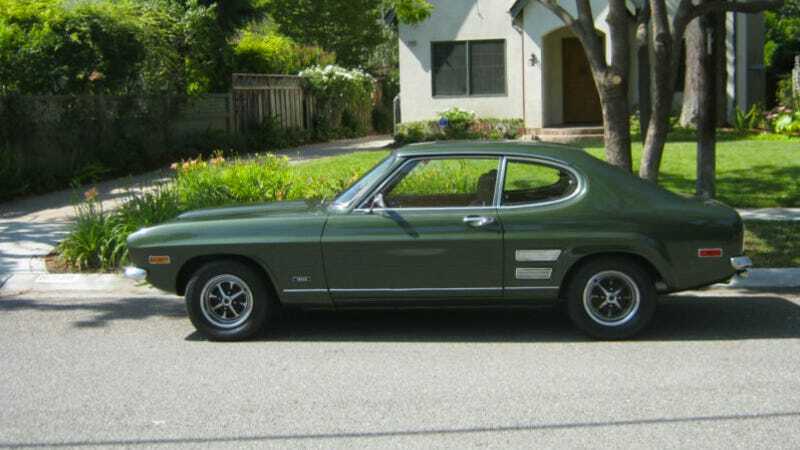 So this 1971 Mercury Capri is a page in history you don't see a lot today. But nonetheless, a fascinating and good-looking one, although you might have to constantly remind people it isn't the Fox Mustang-based Capri or the convertible from the '90s Capri. It may only be a 1.6-liter four-cylinder, but it's such a sharp ride with alloys and a stick. And "wood" trim and bucket seats, too. It's not in perfect shape, but it's damn good for a 42-year-old Ford that's been living in sunny California its whole life. It also smacks of originality, which I'd take over having it in perfectly restored condition. And I generally like the look of the first-generation Capri, since it has so many original Mustang cues packaged on a smaller European scale. But what about the GM fans? How could the Opel Manta be left out? The Capri's arch rival made an appearance through Buick showrooms here over roughly the same time period, from 1971 to 1975. While it's clearly identifiable as a late '60s-early '70s GM product, it has a look of its own and I really like it. This 1974 Opel Manta Luxus, unfortunately, has the unlovely big bumpers mandated at this time, but it's still a generally handsome thing. At 1.9-liters and with a 3-speed automatic, though, I'm guessing the Capri might actually win a race, though. Like the Capri, the Manta's upgraded interior package allowed it such accoutrements as bucket seats and extra fake-looking wood trim, although the red corduroy seats here are bizarre/wonderful. OK, this Manta is in rougher shape than the Capri above, but it smacks of originality and at a claimed 27,000 miles over its 39-year life, it's likely an incredibly rare find. This one's tough, because I prefer the more grown-up looks of the Manta to the first-generation Capri, although a Capri from California is going to be less rusty than a Manta from New Hampshire. But I'd still go with the Opel because I believe it might be more of a head-turner than even an old Capri is today, not because I've become suddenly intrigued by the thought of corduroy seats. And maybe even more than most '70s German cars are in this country, never mind how they got here in the first place.